OnePlus has officially listed a Sandstone White variant of its OnePlus 5T flagship smartphone on the company’s website. This new variant looks similar to the recently launched Star Wars limited edition OnePlus 5T and sports the same ‘sandstone’ textured back as seen on the OnePlus One and OnePlus 2. OnePlus has also posted a video announcing the launch of the smartphone. There is currently no update on when the variant will be launched in India. As we mentioned, the OnePlus 5T Sandstone White has been listed on the OnePlus store at a price of $559 (roughly Rs. 35,400). The variant is listed in only one configuration – 8GB RAM and 128GB inbuilt storage. 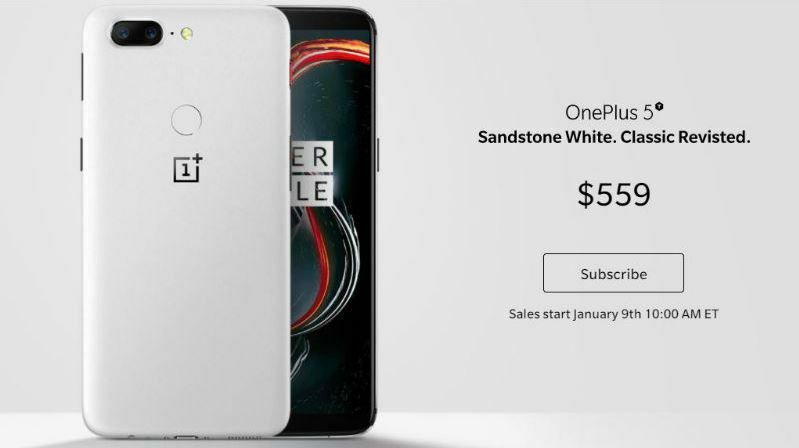 According to the listing, the new Sandstone White variant will be “Available in 4 days”, giving it an availability date of January 9. A ‘Subscribe’ button is present under the listing which you can use to get email updates on the phone’s availability. The OnePlus 5T Sandstone White comes with a textured back panel, similar to the one seen on the phone’s limited edition Star Wars variant. Additionally, it also borrows the red Alert Slider. JD.com had listed the Sandstone White variant just a few hours before the official OnePlus Store listing. The JD listing currently has a price tag of CNY 3,499 (roughly Rs. 34,200) for the OnePlus 5T Sandstone White, among other variants including Midnight Black and Lava Red that are priced at the same amount. To briefly recap, the OnePlus 5T was originally launched in November 2017. The phone sports a 6.01-inch full-HD + (1080×2160 pixels) Full Optic AMOLED display with an aspect ratio of 18:9. It is powered by a Qualcomm Snapdragon 835 SoC, coupled with 6GB/ 8GB of RAM and 128GB inbuilt storage. In addition, there is a 3300mAh battery under the hood.